Linda Collins | Greene County News New plaque of etched Buckeye leaves mounted on columbarium helps patrons identify location of love ones remains. BATH TOWNSHIP — The Bath Township Board of Trustees have approved two outdoor improvement projects. In a 3-0 vote during the Aug. 29 regular meeting, township trustees accepted a quote from Richards Electric LLC. to upgrade the outdoor lighting at the township building, located at 1006 Yellow Springs-Fairfield Road. Township Road Supervisor Mike Rhoades recommended the upgrades to the board and told trustees that the two existing halogen lights, which are situated near the ground, are constantly being kicked over and broken. He suggested replacing the lights with four LED lights that would be mounted high on all four corners of the township building. Rhoades also pointed out the advantages and benefits of the LED lights verses the halogen lights, including lower maintenance and energy costs and the elimination of dark spots. “The township will save money on its monthly electric bills with the LED lights. The lights will shine down from the building and create a safer environment at night,” Rhoades said. According to Rhoades, the estimated cost of the light project would be $2,500. He noted that the quote included the installation of several electrical circuits in the kitchen at the township building and the removal of the existing halogen lights and wiring. The township trustees also approved a project proposal submitted by Cleary Building Corporation to construct a dirt barn at Byron Cemetery. Township Cemetery Supervisor Teresa Phillips provided the details and costs of the barn project to township trustees. Plans are underway to build the barn in the rear, eastern side of the cemetery. The structure will be 14 feet high, 40 feet wide, 56 feet long and one side wall will have an open bay, according to Phillips. “We will have a sliding door on a track that can be pushed to one side or the other so we can store salt on one side of the barn,” Phillips said. After consulting several contractors, Phillips said she narrowed down her choice to two companies, Piqua Lumber LLC. and Cleary Building Corporation. She noted that both companies have good reputations but chose Cleary Building Corporation because the company came highly recommended. The estimated cost of the dirt barn will be $24,419 which includes a 35-year warranty on fading, chalking and the galvanized steel. 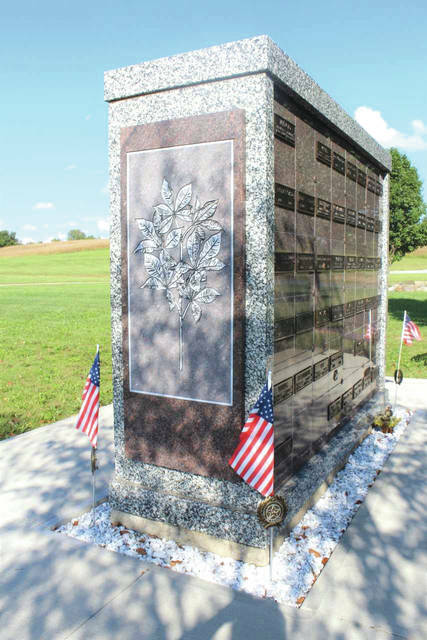 In other business, Phillips reported that a large plaque with buckeye leaves etched on it was recently installed on the front of the columbarium that is located north of the mausoleums at Byron Cemetery. The plaque will be used as a means for identifying the columbarium and a way to distinguish it from the other columbarium. Plaques of etched irises and roses adorn the end walls of the two mausoleums, and a plaque of gingko leaves embellishes the front of the newest columbarium which is located south of the mausoleums. This week, the cemetery grounds crew is pouring 10 yards of concrete foundations for monuments and gravestones. Phillips said she expects to have at least two more pourings this fall. Approximately 16 Norway Spruce trees are also being delivered to the cemetery this week and will be planted at various locations throughout the cemetery. Phillips is anticipating that all the trees will be planted by Friday. https://www.fairborndailyherald.com/wp-content/uploads/sites/50/2018/09/web1_bathtwpcemimprovements.jpgLinda Collins | Greene County News New plaque of etched Buckeye leaves mounted on columbarium helps patrons identify location of love ones remains.